Twenty years later, his son, Charles Marsh junior, was living in Dover and working as a ‘National Schoolmaster’. In 1871 at Sheppey in Kent he married Amy Lydia Hayhow, daughter of Wabon Robert Hayhow, a Sheppey shipwright, originally from Wells in Norfolk. 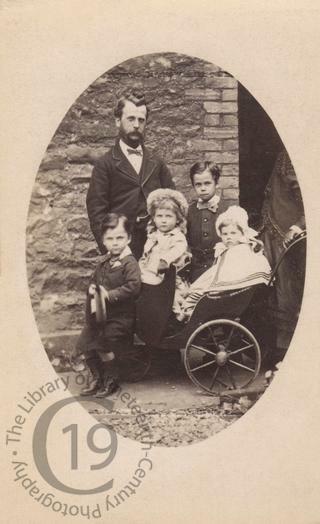 According to inked inscriptions on the reverse of the mount, the four children seen here with their father are: Charles Powell Cromwell Marsh (born 22 July 1872), who died in 1961, aged 88; William Thomas Cromwell Marsh (born 31 December 1875), who died at St Helier on the island of Jersey in 1956; Amy Frances Cromwell Marsh (born 17 March 1877); and Edith Eliza Matilda Marsh (born 11 August 1878). The family appear on the 1881 census living at Charlton in Kent. Charles, the head of the family, was now a ‘Certified Schoolmaster’. His second son, William Thomas, was elsewhere on the night of the census. Amy, aged 4, and Edith, aged 2, were both present and another son, Alfred George Cromwell Marsh, aged 7 months, had been recently added to the family. In 1891 they were all living at Hougham in Kent. Charles had now become a ‘Dealer in Watches and Jewellery’. His eldest son Charles, aged 16, was a ‘Watchmaker and Jeweller’ and his second son William, aged 15, was a ‘Junior Reporter’. Two more children had joined the family since the last census: Louisa Elizabeth, born in 1882, and Arthur Henry, born in 1886. Charles Henry Cromwell Marsh (of Helensburgh House in Dover) died on 7 May 1916, aged 72. The abstract of his will describes him as an ‘Inspector of Weights and Measures’. Photographed by Holden and Co. of Windsor on 1 July 1880, according to the inscription on the reverse of the mount. Mrs Marsh would have been about 7 months pregnant at the time of the portrait, which possibly explains why she can only just been seen at the right-hand edge of the portrait.